Roundabouts can present a considerable hazard to motorcyclists. As well as the risk provided by road defects on and around roundabouts - including diesel spills and pot holes – there is the added hazard of drivers not seeing motorcyclists, perhaps due to other larger vehicles on the road, or bushes planted in the centre of a roundabout, and also of drivers who are in the wrong lane, either on the approach to the roundabout or as they exit. 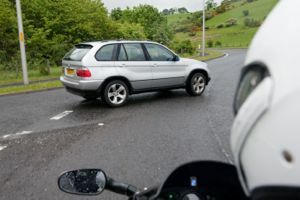 For motorcyclists, ‘Mirror – Signal – Manoeuvre’ is a vital part of approaching and riding around a roundabout but this doesn’t guarantee immunity against an accident – and neither does proper positioning on the road or following the road markings. Most accidents on or near roundabouts happen at a relatively slow speed but as you will almost certainly be the smaller of the vehicles involved, you are still at risk of serious injury and a seriously damaged motorcycle. To find out how the Courts have approached cases involving accidents at roundabouts, please have a look at the decisions below. Remember, no two cases are the same: your case is unique, the accident circumstances are unique and each case is fact sensitive.